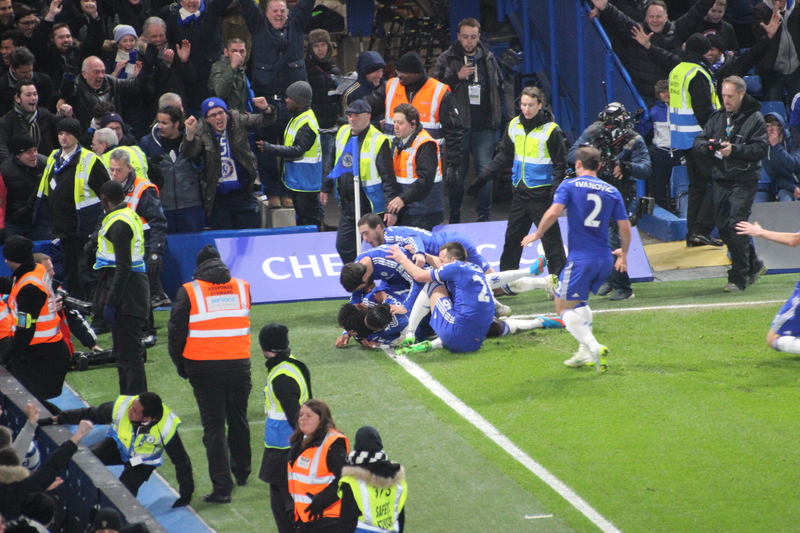 Chelsea vs. Everton : 11 February 2015. As the minutes ticked by, late in the game, my thoughts splintered along two different paths. One thought encompassed the fact that Manchester City, winning by a large margin at Stoke City, would now only be five points behind us. Our inability to convert chances to goals against Everton would result in an entertaining but fruitless 0-0 draw. From a position of power, there would be an unwelcome intrusion of doubt, now, in our ability to stay at the top of the table. The other thought, more fanciful, with diminishing strength with each passing minute, would be that Chelsea would, somehow, manage to strike a late winner, and maintain that healthy and possibly insurmountable seven point lead over our newest title rivals. The clock kept advancing; the time moved on, the night grew older. With only four minutes remaining, a thunderous strike from Nemanja Matic took the slightest of deflections off Branislav Ivanovic. The ball flew hard into the net. Stamford Bridge erupted and our salvation was complete. 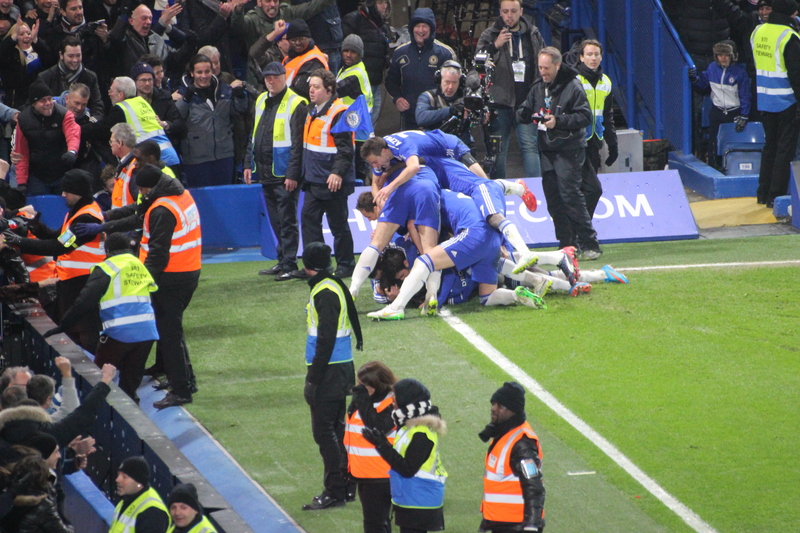 As the stands roared with noise, I captured the run of Ivanovic towards the corner flag below. The powerful defender had scored another huge goal. The stadium was rocking. We were back to a seven point gap. Then, a look of concern on his face – captured through my lens – forced me to glimpse up and across towards the lone linesman on the far side. We slumped in our seats. The five point gap came back in to my thoughts. Soon after, another errant challenge by Gareth Barry – a player that is so boring that I am amazed he has never played for Arsenal – resulted in a long-overdue second yellow of the night. Everton were down to ten men, but I was pragmatic enough to realise that the likely result of this would be even more resourceful defending from the Everton back-line, rather than an advantage to us. 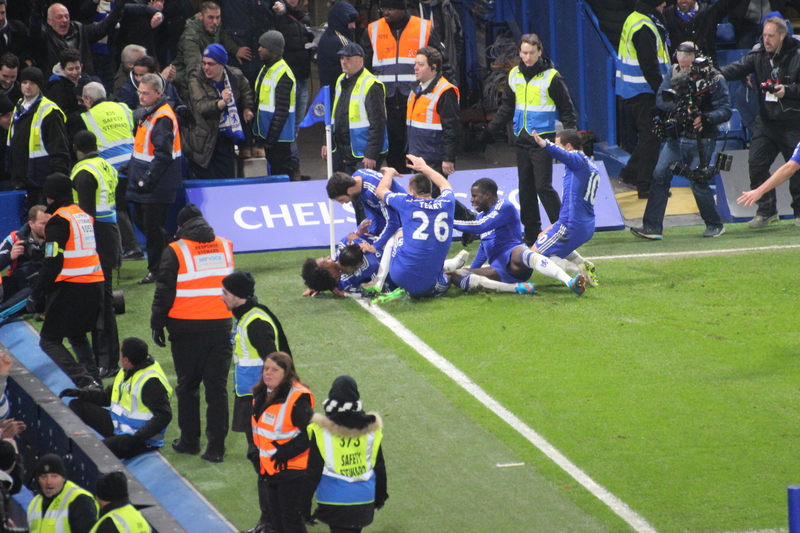 The free-kick which resulted from the Barry challenge on Willian was pumped into the Everton box. It was cleared by a defender, but only reached as far as Willian, in space and unmarked. With little time for any other option, he swiped at the ball, endeavouring to keep the ball low. Through a crowded penalty area, taking the slightest of deflections, the ball flashed past Tim Howard and into the net. I screamed. We all screamed. The noise was louder than ever. With camera raised, I snapped. I could feel the whole upper tier bouncing and vibrating beneath me. It is the reason these photographs are occasionally blurred. 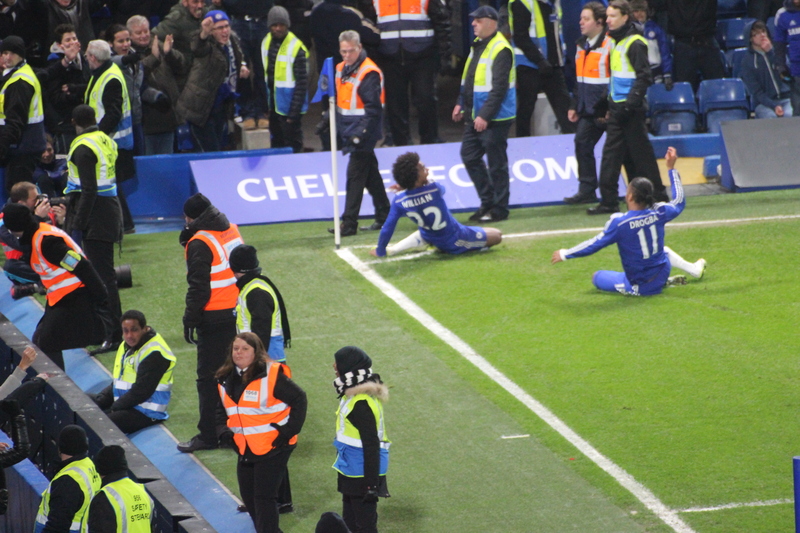 Willian – that was surely something. The gap was back to seven. Photographs completed, I simply turned to Alan and our faces were full of wild joy. I looked to my right and a fellow fan was leaning towards me, arms out, screaming. I reciprocated. I looked over at Joe, a few seats away, past Alan. Joe is around eighty-five and his face was a picture. He too was stood, arms out-stretched, looking straight towards me. We just looked at each other, our faces and our bodies were mirror-images of each other. Wide smiles but arms wider. It was a fantastic and magical moment. Despite my thoughts about our lead being reduced to just five points, this had been a very enjoyable game of football. Sure, our team missed the clinical finishing of Diego Costa, but elsewhere there had been an awful lot to admire. I kept saying to PD that I simply could not fault a single player. Everyone had been excellent. Rather than get too troubled with the lack of goals, I had simply admired the play of all eleven on the pitch and, regardless of the end result, knew that I had witnessed a fine team performance. However, I am positive that my perspective on the evening’s football in SW6 had been greatly affected by the events of the previous few days. Let me explain. On the day of the Aston Villa match, with Parky and myself set to travel to Birmingham for a long-awaited away game after three home games on the trot, my dear mother was admitted to hospital in Bath. Saturday afternoon and Saturday evening was spent worrying about my mother’s health rather than getting too wrapped up in events at Villa Park. I was in the Accident & Emergency Department of the Royal United Hospital in Bath when Eden Hazard opened our scoring on Saturday and I was in Parky’s front room when Villa equalised and when Brana gave us the lead. A win at Villa Park was welcomed, but my thoughts were elsewhere. I was able to visit my mother later on Saturday evening and was relieved to hear – and see – that she was responding well to a course of antibiotics, while both nurses and doctors calmed me with positive news. Mum continued her rehabilitation on Sunday. What a relief. On Monday, however, another twist. After work in Chippenham, I drove over to visit my mother in hospital. As I drove past Bath race course, then down the steep and narrow Lansdowne Lane, I was relishing to see my mother’s smiling face once more. Just after 4pm, I noted that traffic was halted ahead of me. I waited. I saw a couple of cars reverse and head through a housing estate. The road was obviously blocked ahead of me. I followed suit, but just happened to glance past where a bus had stopped. I was saddened to see a young chap, plainly distressed and agitated, pacing the road and talking on his mobile phone. Then, a horrific sight. I saw a woman, lying on her side, amid debris. Sadly, I also saw a rug or blanket seemingly covering a body completely. My heart sank. I looked up and saw another person on the phone, in tears. As I slowly drove to the hospital, police cars and ambulances flew past. My head was spinning. An accident – maybe involving the bus – had only just happened. I immediately remembered that I had stopped off, for around five minutes, in Chippenham for a sandwich wrap, some crisps and a drink. I had been annoyed at the length of the queue in the shop. Looking back, those five minutes might have saved my life. After visiting my mother – more improvement, more smiles – I listened to the radio on the drive through Bath and the breaking news was that four people – four! – had been killed when a tipper truck careered out of control down Lansdowne Lane. I was numb. I needed to talk to someone, so I ‘phoned a work colleague. I slept uneasily on Monday night. My mother continued to improve on Tuesday. On Wednesday, I was required to meet a doctor around midday, so I booked a half-day of holiday. The doctor confirmed that Mum had experienced a mild bout of pneumonia, but was well on the road to recovery, with a discharge likely to happen by the weekend. What relief. I drove to Parky’s, met up with Young Jake for his first game of the season, then we all piled in to PD’s Chuckle Bus as he drove to London. It was time for me to relax. It had been a tough few days. I slept for an hour; I guess I needed it. We were in the pub by 4.30pm. And it was a relaxing time in The Goose. Friends showed concern for my mother, but also for me, following the road traffic accident. It was lovely to see my mate Orlin, just in from his home in San Francisco, and en route to his home city of Sofia before dropping in to Paris on his way home again next week. Orlin is a member of the UEFA away scheme and our paths often cross in a variety of exotic locations; Tokyo, Istanbul, Turin, Bucharest. There were, typically, moments of roaring laughter, but also moments of quiet contemplation. A friend – The Youth – spoke earnestly with me and with great understanding about aging parents, dementia and care. It was good to talk with someone who can relate to my circumstances; he lost his father only recently. 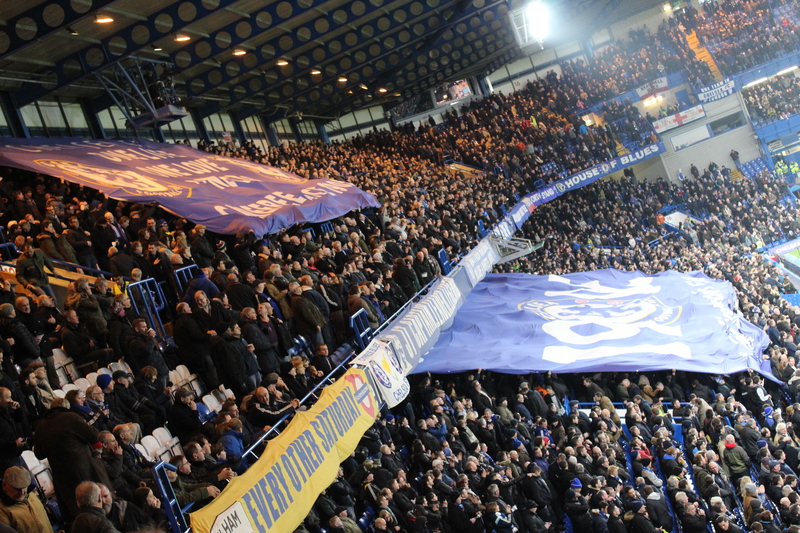 At times of need, my Chelsea Family are always there for me, rain or shine, just like we are always there for the team. The simple fact should never be forgotten. On this day, more than others, I was able to stand back and take a wide-angled look at life, football, the whole 110 yards. In The Goose, among friends, I liked what I saw. As an aside, I was reminded of that ridiculous statement, claimed as an original by Bill Shankly, but possibly purloined from a US football coach, about football being more important than life or death. Although I understand the underlying message, it is of course, utter nonsense. Life, death, football, in that order. Inside the stadium, I think Alan was surprised to see me. In the circumstances, a half day holiday worked just fine. Sadly, one of our match-going friends, Tom, isn’t so well and there was concerned conversations among a few of our near neighbours. Warm wishes go to him. Everton had brought around two thousand; around a thousand had been returned. Their season has been a strange one; one of promise unfulfilled. The 6-3 game at Goodison in the warm August sun was a crazy game of football. There would be no repeat on a cold night in February. It was a fine game of football, however. New signing Juan Cuadrado, wearing Carlo’s old number 23 shirt, started alongside Willian and Eden Hazard in midfield, with Loic Remy up top. Matic was paired with Ramires. Mourinho elected to chop and change his defenders again; in came Zouma, out went Cahill. Between the sticks, in came Petr Cech. I was glad to see Mourinho rotating slightly. Over the course of the whole season, nothing can replicate game-time for our squad members. I liked the way that our midfield three ran at Everton in the first-half, often changing positions along the line. The Tottenham loanee Aaron Lennon was roundly booed. We peppered the Everton goal early on, but Petr Cech did well to save from Lukaku. A crunching tackle by Kurt Zouma on the returning Romelu Lukaku, down in front of me, was simply wonderful theatre. I was thrilled by the dominating presence of Nemanja Matic, who patrolled the middle of the park in a regal fashion, breaking up play, tackling, then turning and opening up the Everton defence with clever passes and strong dribbles. Cuadrado looked sharp. We just needed a goal. Remy and Terry went close, but the game remained without goals at the break. In the concourse, I bumped into another mate from the west coast of America; Pete, once of San Francisco, now in Seattle and the proud father, at the age of forty-eight, for the first time. It was lovely to see him again. In the second-half, more pressure from Chelsea, with Hazard and Willian in devilish form, spinning away from markers, causing panic everywhere. Tim Howard was enjoying a brilliant game, thwarting many of our strikes on goal. Off the pitch, the noise was encouraging without being too loud. Everton were quiet. With Chelsea on top by quite a margin, it came as a blow to the stomach to see a cross from the Everton left pick out an unmarked Lukaku inside the Chelsea six-yard box. Here was an Everton goal surely? Miraculously he missed. To be exact, miraculously Petr Cech saved. It was a stunning block. With twenty minutes to go, Remy and Cuadrado – both had played well – were replaced by Didier Drogba and Cesc Fabregas. Everton rang the changes too. Substitute Mirallas went close. With four minutes to go, the game came alive. This entry was posted in Season 2014-2015 and tagged 2014-2015, Everton, Parents, Willian by Chris Axon. Bookmark the permalink.